For business customers we offer meetings, presentations, conferences, workshops and seminars in modern conference room. The stylish atmosphere provides excellent organization of events on the diplomatic, business and political elite, professional PR-and the opportunity to reflect on the events leading Bulgarian and foreign media. The management of the hotel ensure the success of each meeting, an individual approach to the requirements of its guests. The capacity of the conference room is 70 people, possibly for different tiers of tables and chairs - theater or cinema presentation, classic U-shaped layout, unconventional Box and classroom type, suitable for training. 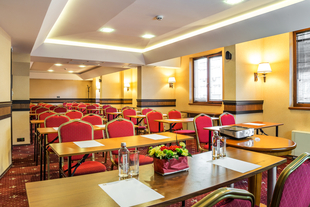 In the conference room is available flipchart, screen, multimedia projector, and compliment - notebooks and chemicals from the hotel. In advance can be provided simultaneous translation over 10 languages. The hotel staff at the Best Western Plus Bristol Hotel is prepared to organize events during coffee breaks, lunches and cocktails.